Farewell my Darling Partner. May you rest in peace. I will always miss you and you will always be my partner and in my heart. 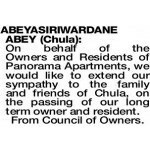 Jan.
ABEYASIRIWARDANE: The Funeral Cortege for the late Chula Abeyasiriwardane of East Perth, will arrive at KARRAKATTA Cemetery on FRIDAY (26.4.2019) for a Cremation Service commencing at 11.30am. All our love and fondest memories go out to you Chula. You were are remarkable person. Loving, generous and selfless. Rest in peace. 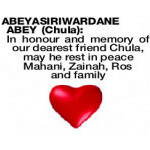 ABEY CHULA One of life's genuine gentlemen and friend, I have had the honour and pleasure of knowing you. In Gods care, in peace....Marco. 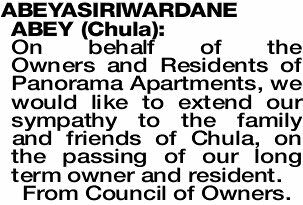 On behalf of the Owners and Residents of Panorama Apartments, we would like to extend our sympathy to the family and friends of Chula, on the passing of our long term owner and resident. 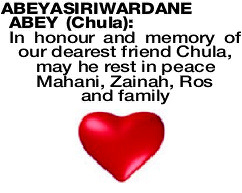 ABEYASIRIWARDANE ABEY CHULA A valued friend for over twenty years. I'll miss our chats and friendship. May you rest in peace. Jess.